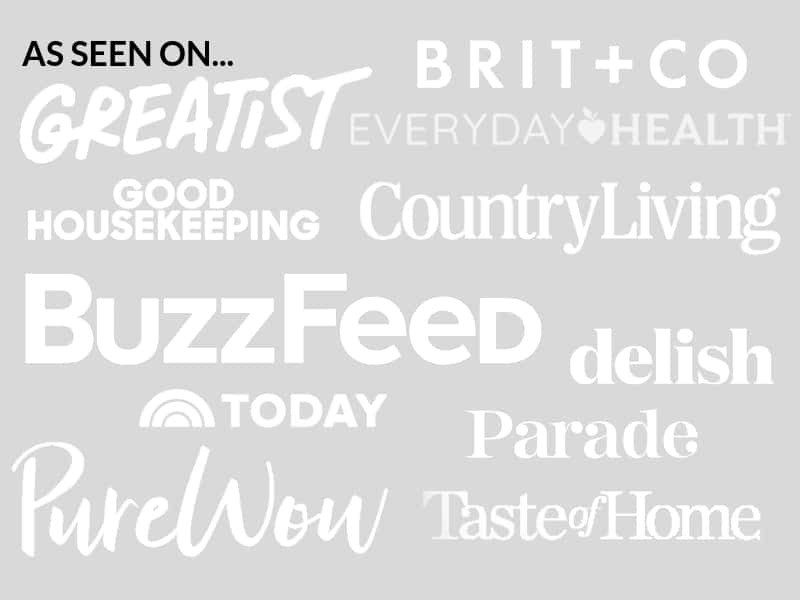 October 20, 2017 By Elizabeth Lindemann 1 Comment / This post may contain affiliate links. As some of you know, I started my very first vegetable garden this past spring. I got quite a bit of food out of it! One of the last and final crops holding on even through the Texas heat was a little bit of kale. 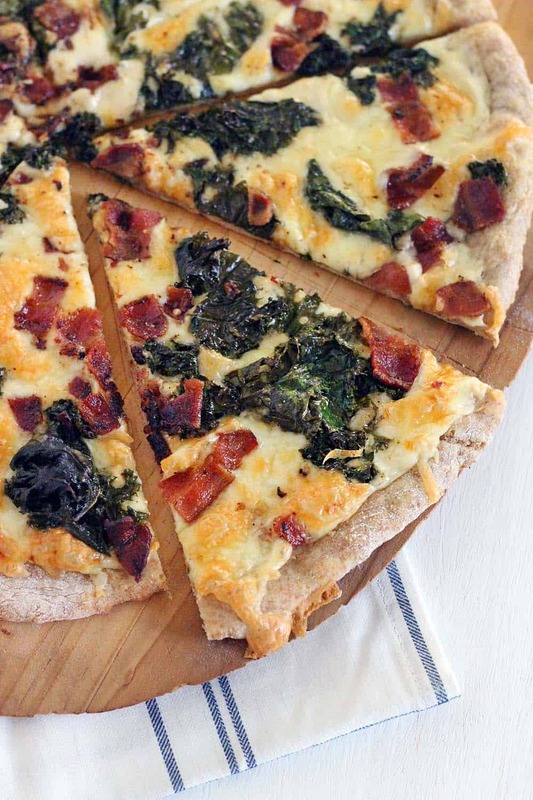 I put it to good use with this Bacon and Kale Pizza, which is our new family favorite. 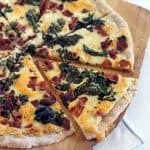 This pizza recipe is SUPER simple. It uses only 5 total ingredients, and takes under 30 minutes to throw together (assuming you have pizza dough already made). Thank you to my sister- and brother-in-law for the awesome inspiration for this recipe! Here’s what makes the kale amazingly delicious. First, it’s sautéd in the bacon fat. Why? Because it’s the right thing to do, that’s why. Second, it continues roasting in a super hot oven on top of the pizza, resulting in crispy crunchy pieces similar to kale chips. Honestly, I don’t know which is better- the crispy kale pieces or the crispy bacon pieces. And that’s saying a lot. Bitter green vegetables and bacon go together soooo well. And actually, this pizza recipe is very similar to my brussels sprouts and bacon pizza. This time, however, I used prepared Alfredo sauce as the base instead of olive oil. I wanted this recipe to be extra quick and easy so I used store-bought sauce, but you can certainly make your own if you want to. Perhaps the most exciting part of eating this pizza was the fact that we were able to give Zoey some little nibbles of it! She got the go-ahead from her pediatrician to eat (almost) anything and everything under the sun, so I’ve been giving her all kinds of tastes of things. And we figured the sooner we can get her to eat kale, the better. She loved it! AND, for those of you who read my last post (Smoky Chicken and Avocado Tacos), I have good news: Zoey is slowly but surely coming around to liking avocados! Phew. She is my daughter, after all. I was worried for a while there. I always make pizza using my cast iron pizza pan. If you have one, good for you! If you don’t, I highly recommend one. But you can use a pizza stone, or rimmed baking sheet, or anything that you usually use to make pizza for this recipe. 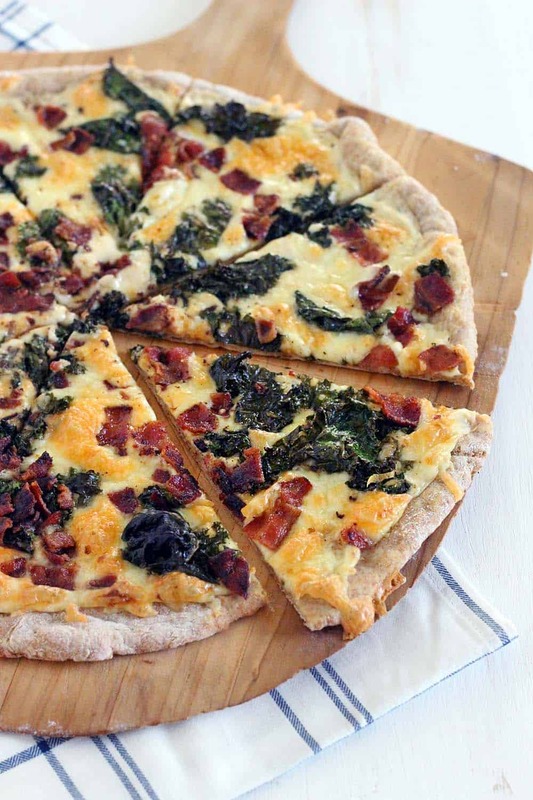 Here’s the printable Bacon and Kale Pizza recipe! 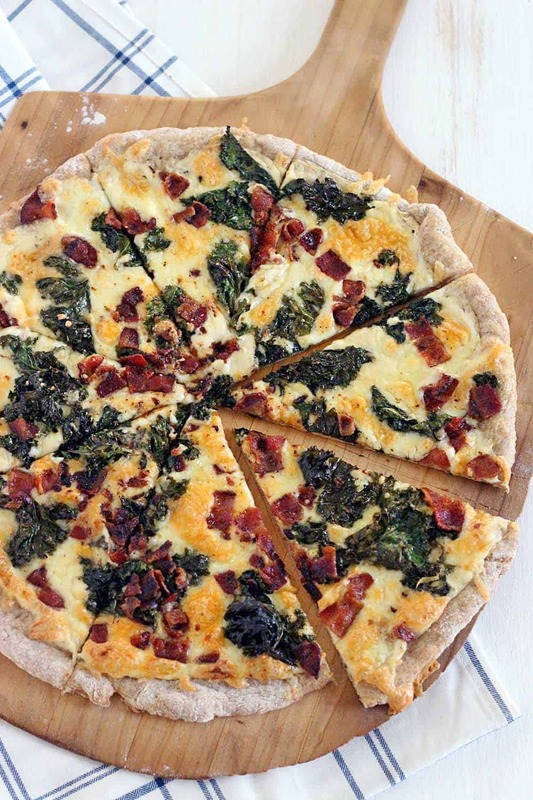 This Bacon and Kale Pizza is topped with super crispy kale and bacon pieces. This recipe comes together with only 5 ingredients in under 30 minutes! Preheat cast iron pizza pan or pizza stone while oven preheats to 500 degrees F.
Meanwhile, roll out pizza dough and allow to rest on floured pizza paddle. Cook the bacon in a skillet until crispy. Remove and set aside on a paper towel lined plate. Drain all but 1 tablespoon bacon grease from skillet. Add kale leaves to skillet; sauté over medium high until softened and beginning to get crispy (about 3 minutes). Once oven has preheated, remove pizza pan or stone and turn heat down to 450 degrees F.
Carefully transfer dough to preheated pan. Spread the Alfredo sauce on the dough, followed by the shredded mozzarella, the kale, and the bacon. Place the pizza back in the oven for 10-15 minutes, or until cheese is fully melted and beginning to turn golden brown. Allow to cool on pizza paddle for at least 5 minutes before slicing. Hi Marcie! I don’t usually include nutrition information in my posts for two reasons: 1) I don’t count calories myself (instead I try and stick to eating a variety of “real food”), and 2) because I’m not a nutritionist, I can’t guarantee accurate information. You can read more about why in my FAQs. However, that there are some great online tools that can help give you an estimate of the nutrition information! This calculator will let you copy and paste the ingredients (you may have to make a few tweaks manually), enter the amount of servings, and it generates a nutrition label with all the info you need. And yes, this recipe is fairly high on the fat content (but like calories, I personally don’t usually pay attention to that). Hope this is helpful!